One faces a paradox when one hits something unexpected. However, there is nothing paradoxical in hitting a paradox! Paradoxes happen naturally. Why? This question was answered within a regular Java User Group (JUG) session in Ostrava, Czech Republic, on March 2, 2011, not just in a general sense but especially from the API Design point of view. And who could better talk about "Paradoxes of API Design" than the man who is the founder and chief architect of the NetBeans Platform, i.e., Jaroslav Tulach? 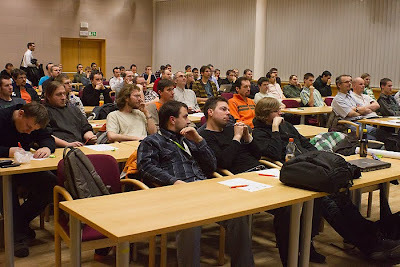 Within his one hour presentation, Jaroslav expressed his personal feelings and shared his individual experiences with Java fans, who crowded into the aula of the VSB Technical University in Ostrava, where the session was held. If you are interested, you can visit Ostrava JUG blog (in Czech), where you can find the presentation and the video from the session and some photos as well. After the presentation, which received very positive feedback by the way, Jaroslav led one of the scheduled "Open Spaces" where he led discussion about the topic, with a smaller group of API Design enthusiasts. The successful and very worthwhile evening ended in the famous Stodolní street, where a handful of the most devoted people had a chat with Jaroslav in one of the local pubs... until deep into the night. The Ostrava Java User Group is organized by a couple of Java fans from Tieto Czech company with the cooperation of the VŠB Technical University in Ostrava. 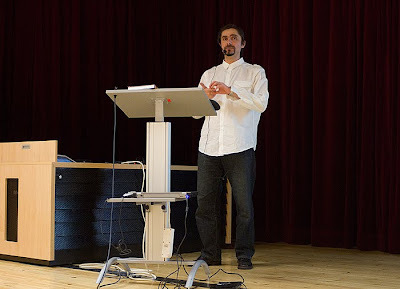 On behalf of all the organizers, we would like to thank Jaroslav Tulach (NetBeans) once again, for paying us a visit and sharing his experiences with us! Ostrava JUG organizers: Ondřej Kvasnovský, Jan Pfeffer, Tomáš Tureček and Kristýna Wasylkiwová.